It’s almost spring! Before having your air conditioner work in full swing this hot season, here are a few steps to take to avoid unhappy surprises. Check your air conditioning system for any signs of wear and tear. Visually inspect every part and component to identify potential issues that might have built up during the long winter months while the system is not in use. Look for worn out wires and dusty components. Don’t hesitate to call an expert for a comprehensive and professional inspection. Before kicking on your A/C unit, would you mind checking your outdoor unit first? Be sure to remove all dirt including dust, leaves, and other debris. Get rid of anything that may hinder the proper flow of air. You may remove the cover if it has accumulated dust and debris on it. Has it been since last spring when you changed your air filter? If yes, we recommend replacing your air filter as early as now. With a new and clean air filter, you are guaranteed of healthier indoor air that your family can breathe in. If you have second thoughts about which air filter to use for your cooling system, contact our experts for advice and recommendations. Surely, you do not want to be caught up in the heat this hot season. So as a preventive measure, make sure to test your A/C system to know if it can keep up with your comfort demands. Consider doing a test run to avoid possible mechanical failures during operation. Turn it on then set your thermostat to the right temperature. With this, you’ll know if your system needs repair before you actually need it. Preventive maintenance is the key to maintain your comfort during the dog days of the year. The best time to schedule a tune-up is spring because technicians aren’t busy for the summer rush. A preventive maintenance service will keep your cooling unit looking good inside and out. Not only that, but a tune-up service also ensures comfort for the family all year-round. 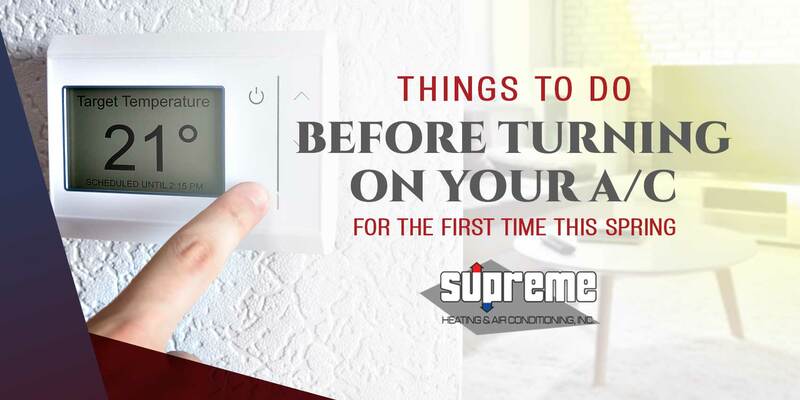 Don’t delay calling our team at Supreme Heating & Air Conditioning, Inc. for your cooling needs this spring! We’re here to deliver utmost comfort with the best solutions we have!